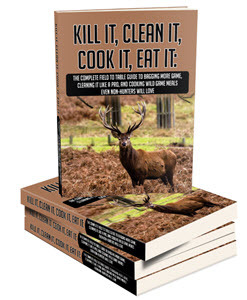 Shotgun slugs are used for deer and bear hunting in heavily populated areas where the slug's rapid loss of velocity allegedly affords greater protection from shooting mishaps. Three types of shotgun slugs are on the market: the European Brenneke; the American Foster and the Sabot (Figure 8.12). 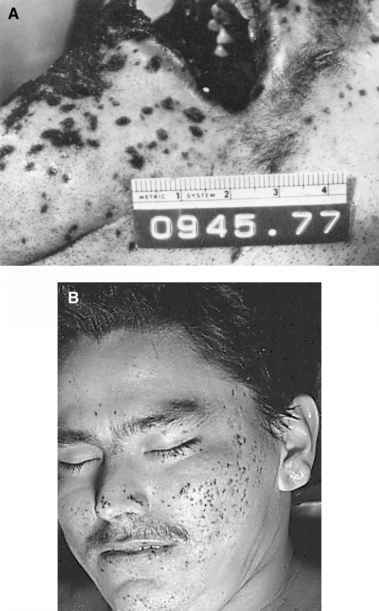 Figure 8.11 (A) Large, irregular stipple marks of face caused by coarse, white polyethylene filler loaded in early Winchester buckshot loads. (B) Fine stippling due to fine plastic filler. Figure 8.12 Shotgun slugs: (a) Foster, (b) Brenneke, and (c) Smith & Wesson sabot. the country of manufacture. 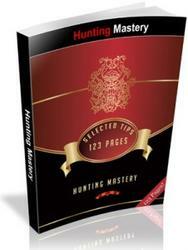 The advertised muzzle velocity ranges from 1593 ft/sec in 12 gauge to 1513 ft/sec in 20 gauge. The diameter of a 12-gauge slug, measuring from the top of one rib to the other, is 18.47 mm (0.727 in.) and 16.13 mm (0.635 in. ), from groove to groove. The Foster slug, introduced by Winchester in 1936, is considered the traditional American shotgun slug. It is a roundnose soft lead projectile, with a deep, concave base, and has anywhere from 12 to 15 angled, helical grooves cut into its surface. This slug is produced in a hollow-point version. The hollow-point cavity serves no purpose in the author's opinion in increasing the effectiveness of the slug. The Remington slug may have a plastic insert in its tip. Slugs manufactured by Federal have a one-piece plastic wad; Winchester's having a cup wad and cardboard (paper) filler wads — the one next to the slug being thinner and harder. Remington uses a combination of plastic and cardboard wads. Variations on these construction designs will be encountered as the type of wadding always seems to be in flux. Both the Brenneke and Foster slugs employ the same principle to stabilize their flight. In both, most of the weight of the slug is forward of the center, thus causing them to fly point forward. The lead grooves or ribs cause the slug to slowly rotate on its long axis as it flies through the air increasing stability. This slow rotation, combined with the balance created by a heavy nose, results in greater accuracy. Foster slugs are made in 10, 12, 16, 20, and .410 gauges. In diameter, the slugs are equal to or smaller than the tightest choke. On firing, the slugs expand and fill the bore. The weight and nominal velocity of the slugs is given in Table 8.4. The Sabot slug was introduced to the United States by Smith & Wesson. They no longer manufacture ammunition. This slug was made only in 12 gauge. It had an hourglass configuration with a hollow base in which there was a white plastic insert. This slug lay in a sabot consisting of two halves of high-density polyethylene plastic. The slug, encased in the sabot made a projectile of 12-gauge diameter. On firing, the sabot with the enclosed slug, moved down the barrel as one unit. The sabot contacted the bore, not the slug. On exiting the muzzle, the sabot fell away. shells were closed with a rolled crimp. In both shells, the sabot rested on a cardboard wad, which in turn rested on a white plastic wad. The police version of the sabot slug was intended to be fired in weapons having only a cylinder or modified choke. Firing in weapons of greater choke could cause the slug to snap at the hourglass waist. The civilian slug, of softer lead, could be fired in weapons of any choke. Sabot shotgun shells are now manufactured by Federal, Remington and Winchester in 12 and 20 gauge (Table 8.5). The weight of the slug is usually 1 oz (438 gr.) in 12 gauge and 5/8 oz (275 gr.) in 20 gauge. Remington manufactures a 1 3/16 oz (520 gr.) sabot slug for its 3 in. (76 mm) 12 gauge loading. Its 20-gauge sabot slug weighs 3/4 oz (328 gr.). The Federal slugs have a "hollow point" and may be copper plated. Nominal velocity for the Sabot slugs ranges from 1200 to 1550 f/s. The Winchester Sabot has a pentagonal hole in the tip of the slug and a hole in the base closed with a plastic plug. The shell has a cup wad and a cardboard filler wad. In 1993, Remington introduced Sabot slugs of solid copper rather than lead. There are four machined slots in its nose to produce expansion. The slug is encased in an eight-fingered plastic sabot. As the slug penetrates tissue, the nose sections open, increasing the diameter of the projectile and the loss of energy. Upon complete deployment, the nose sections, which each weigh 20 gr. each, separate from the main mass of the slug producing four additional wound tracks. Subsequently, Federal introduced a solid copper hollow point slug in a plastic sabot. These rounds are intended for use in rifled shotgun barrels. The wound of entrance from a shotgun slug, whether it be a Foster, Brenneke or Sabot, is circular in shape, with a diameter approximately that of the slug. The edge of the wound is abraded. Determination of the gauge from the diameter of the entrance wound is not possible. At close range, the wads from a Foster shell either enter through the entrance hole or strike adjacent skin producing circular to oval imprints. In the case of the Sabot round, at close range the two halves of the sabot may either enter the body or impact the skin. If they impact sideways, the rectangular pattern produced is fairly characteristic (Figure 8.13). In the case of a Brenneke shotgun shell, no matter the range, the wadding enters with the slug because it is literally screwed into the base. Figure 8.13 (A) Deceased shot immediately in front of ear with 12-gauge Winchester Sabot slug. Injury from sabot behind eye, range less than three feet. (B) Close-up of wound from plastic sabot and sabot. of lead adjacent to or surrounding the disk. These comma-like pieces of lead break off from the edge of the pancaked slug (Figure 8.14). 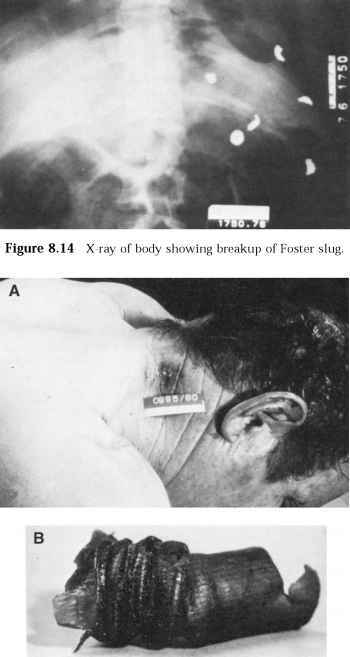 Foster slugs do not produce the x-ray picture of the "lead snowstorm" seen with high-velocity hunting rifle bullets. In the deaths seen by the author due to the Sabot round, the slug has always exited. Internal injury was very severe. Scattered fragments of lead were deposited if bone was struck but there was no true lead snowstorm. Rarely, one will encounter jury-rigged slugs constructed from birdshot shells. In these instances, a deep groove is cut around the circumference of a birdshot shell just in front of the metal head. On firing, the tube is supposed to separate at this cut. The tube, containing its load of shot and wadding, then travels down the barrel, exits, and continues as one missile to the target, producing a single wound of entrance. At autopsy, one recovers from the body, the tube, the wadding and the pellets — sometimes still in one piece. Figure 8.15 illustrates such a case. The deceased was shot twice in the head with a 12-gauge shotgun firing birdshot shells. Recovered from the body was the plastic hull with the plastic wad inside. 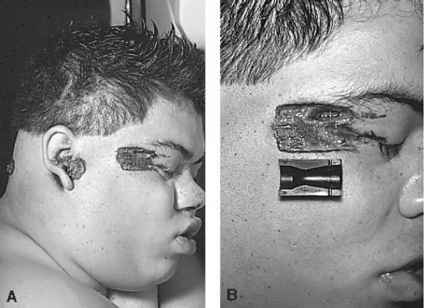 Figure 8.15 (A) Entrance wound of right side of back of neck; (B) Recovered portion of hull from wound. barrel. On firing the weapon a second time, an unaltered buckshot shell was used. The buckshot and wads swept the deposited hull out the barrel into the body. Thus at autopsy, buckshot and wads from the second shell and the distal two-thirds of the tube from the birdshot shell were recovered from the body. While separation at the point the hull is cut may have occurred consistently in the age of paper shotgun shells, with plastic tubes separation usually does not occur. In repeated attempts by the author to cause separation by cutting the hull just in front of the steel head, he found that he almost had to cut the shell in two to cause consistent separation. Separation at the point of notching was the exception not the rule.